Travelling in the near future? Then why not book your hotel rooms through our partners, Agoda? Agoda have been offering secure bookings online since 1998. Choose from tens of thousands of hotels worldwide, with instant confirmation for your booking and friendly cancellation policies in case you have to change your plans. And you can make up to 5-10% additional cash savings with the Agoda Rewards programme! 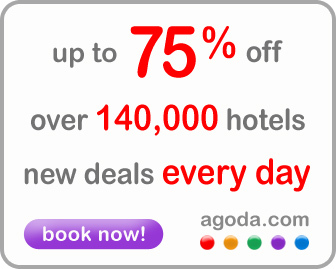 Book your hotel NOW with Agoda! This entry was posted	on Monday 1 November 2010 at 00:01	and is filed under Travel bookings. You can follow any responses to this entry through the RSS 2.0 feed. You can leave a response, or trackback from your own site.